If you read the June 2010 issue of PhotoComment Magazine, you would have found our review of Jodi Bieber’s book ‘Soweto’ which caught the eye of many foreigners during the world cup. 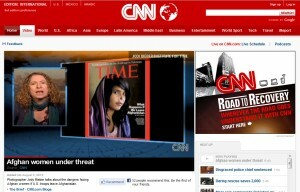 Now Jodi is making headlines again with her photographs of Afghanistan women in the August 9, 2010 issue of TIME Magazine. If your attention has not been drawn to the startling yet beautiful portrait on the cover in your recent trips to the magazine rack then they must have been sold out because I don’t know how else you would have missed it. The story has even made it onto CNN with Jodi being interviewed by Jim Clancy. You can watch the interview online here.